If LaFerrari is the best of the breed, which Ferrari is next in line? I have recently set myself the task of identifying any public negativity towards the Ferrari 458 Speciale. I didn’t drive the car when it was launched at the end of last year and, like many of you, sat back and read the eulogies as they were published. And I’m not trying to be arch here – Ferrari is in the rudest of health right now, pretty much anything it tries in the road car space is perfectly executed and class leading. If only its Formula One programme could say the same. Despite much rummaging, I managed to locate zero hate for the Speciale. Which makes sense. When Ferrari decides to make a lighter, faster version of the 458 – a car which four years after it was launched remains the finest mid-engined sports car on the planet – you reasonably expect something special. It’s taken me nearly a year to plonk my posterior into one – and I’ve found the experience enlightening on many levels. Firstly, I cannot help but imagine how the 24-year old me would respond to this car – new to the job of testing cars, previous fastest ride: an early Lotus Elise. 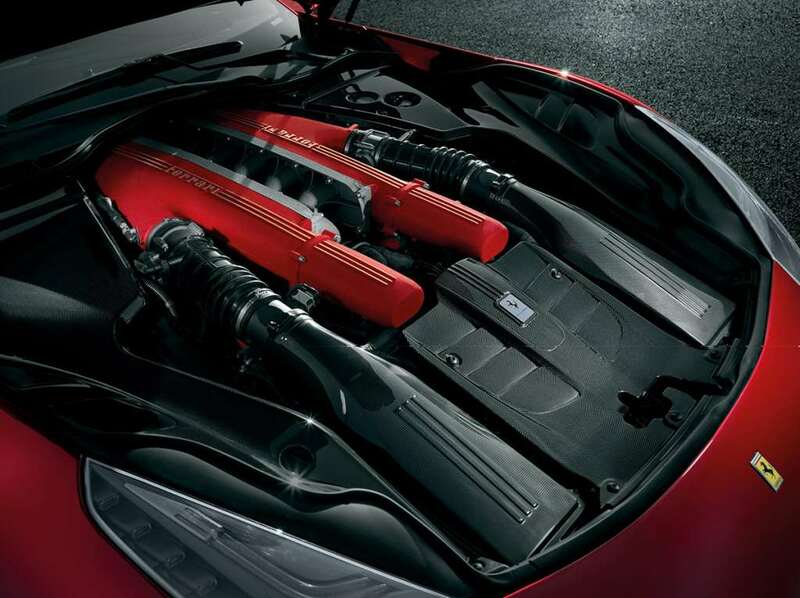 You see, the Speciale offers a turn of speed that is difficult to explain. I used to sit and gawp at the Autocar performance figure for the McLaren F1 and assume that nothing would ever come close, but in real terms the Speciale is probably a bit quicker than the McLaren. This car would have terrified the 24 year old me, and I wouldn’t have had the nerve to reduce the intervention of the electronic chassis systems and see what lurked beneath because I’d have assumed that being mid-engined, Italian and molto-powerful, the Speciale would be looking to kill me at every opportunity. But that’s what we do these days – we climb into 600hp mid-engined machinery and drive it like some £3000 BMW drift car. Not because the few of us who choose to film cars in this manner are especially handy behind the wheel, or because we have any particular disregard for tyres, but because Ferrari’s chassis experts have taken the art to a new level; one that has left Porsche and Lamborghini scrabbling around for answers. I never even dreamed you could play the fool with a car of this type. It is ludicrously competent, unfeasibly good fun; undeniably the best sports car I’ve driven this year. So why on earth do I think the Speciale is only the third-best car Ferrari currently makes? We know it has the misfortune of being launched in the same model year as one of Maranello’s once-in-a-decade hypercars, the extraordinary hybrid LaFerrari, but that should only relegate it to the second step on the podium. But offer me the keys to the Speciale or an F12 and I wouldn’t look twice at the mid-engined car. 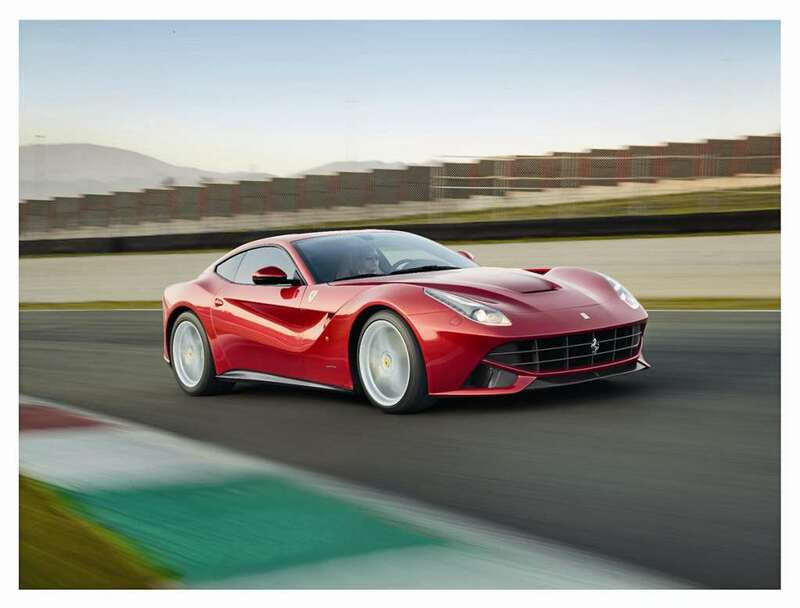 The F12 is, for me, the Ferrari road car. I was ready to accept that the new-kid-on-the-block would render my favourite Ferrari mostly obsolete, such is the way with the furious pace of this fast-car industry, but my time with the Speciale left me even more enamoured with the F12. So here’s why I prefer the V12 – don’t you just love all this real-world car journalism? There are elements of shape-shifter about the lightweight 458 – it isn’t always quite what it seems, or what you expect it to be. Initial contact doesn’t suggest this. The motor yelps on start-up and throttle response is synapse rapid – you think about flexing your achilles, it gains 4000revs. Then you sit and toe the heavily-sprung throttle just to take stock of the urgency. Angry -it all feels quite angry. And it always feels unnervingly quick – it just pulls and pulls from very low engine speeds, which is the first unexpected action because a 4497cc V8 pushing 135 bhp per litre and revving to 9000rpm should be all peakiness and no guts. The torque is relentless, from 3500rpm, throttles wide open and exhaust valve set to ‘we’re laughing at the EU drive-by regulations’, the Speciale is turbodiesel flexible. Perhaps too flexible. Because if the buxom mid-range is unexpected, it might also be a little surprising for even the best mid-engined chassis out there. Whisper it, but this car, even fitted with 305 section super-sticky Michelins, is traction limited in second gear on a dry circuit – in cold weather and with the odd damp patch it would spool-up in fourth. Is this a problem? Not at all. It simply leads to the immediate exploitation of a truly wonderful chassis, instinctive steering and agility. And the driver is perfectly isolated from any extreme behavior by the best set of chassis electronics I’ve encountered – they blend brakes, throttle retardation and differential tweaks without the driver feeling any lurching or grabbing. But I just didn’t expect it to be quite so unruly with nanny state disengaged. I did expect a little more music though. The Ferrari V8’s noise-classification has gradually crept from musical to plain noisy for some years now, and the Speciale marks a low point for me. It’s loud but nondescript – for evidence of this, stop reading this now and click ‘play’ on this video of a 355 wearing a naughty exhaust. That is music. Back to the Speciale though, and the switch from closed valve EU-drive-by-cheat to open pipes is ludicrous and unnatural: you add 1mm of throttle, accrue 3 mph and the accompanying crazy bark suggests you’ve just broken the sound barrier. This encourages bystanders in villages to offer one-handed cocktail shaking impersonations. And that is neither good for the village population of the UK, nor the social acceptance of fast cars on this Island. 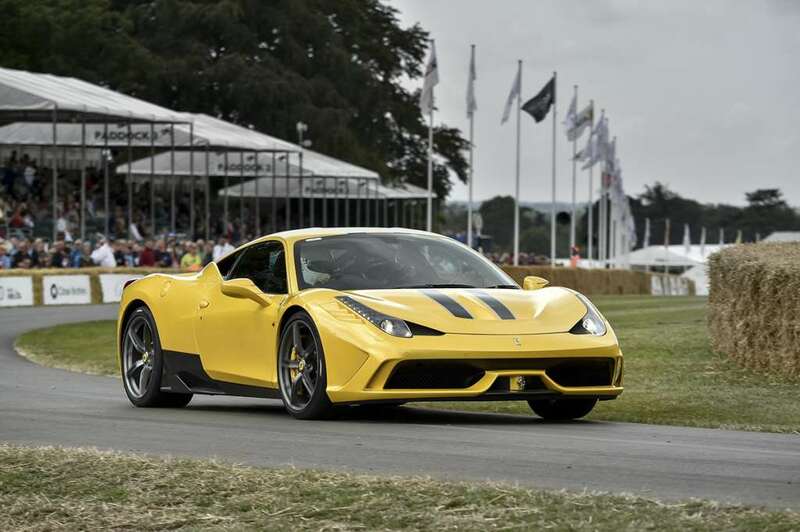 There are also question marks over how one might use a Speciale – it is so loud that it cannot be used on any normal UK track day, and yet its specification is pure circuit toy. The test car didn’t even have a radio. Why am I picking so many holes? Because the F12 beats the Speciale in those specific areas. Don’t ask me how a front-engined 740hp Dobbin has more traction than a 600hp mid-engined example, but it does. By all means ask me why I think the abjectly perfect 6.3-litre V12 makes the V8 seem like a mere propulsion device: the evidence is undeniable. 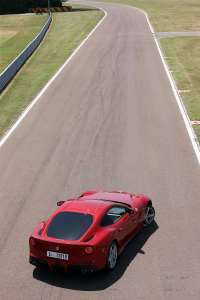 The F12’s motor is the best road car engine on sale – if anyone disagrees with that statement, they are sadly wrong. And then there’s the styling – the F12 is the dignified GT – more upright and less assertive; the Speciale is all jutting chin and peacock plumage. Yes, the 458 carries a very big stick, but it also shouts very loudly about the size of said implement. I suppose I just prefer the quieter life – haha! – in a 740hp V12 Ferrari. The lightweight 458 is one of the best cars I’ve driven in 2014. It lifts the mid-engined genre even further away from the competition and, as is always the case with the ‘latest thing’, is rightly basking in the glory of all those magazine end-of-year test victories. But if there was an F12 at the other end of the car park, I’d walk straight past the V8 to drive it. I should duck when I say this, but it’s the best car Maranello has ever made. 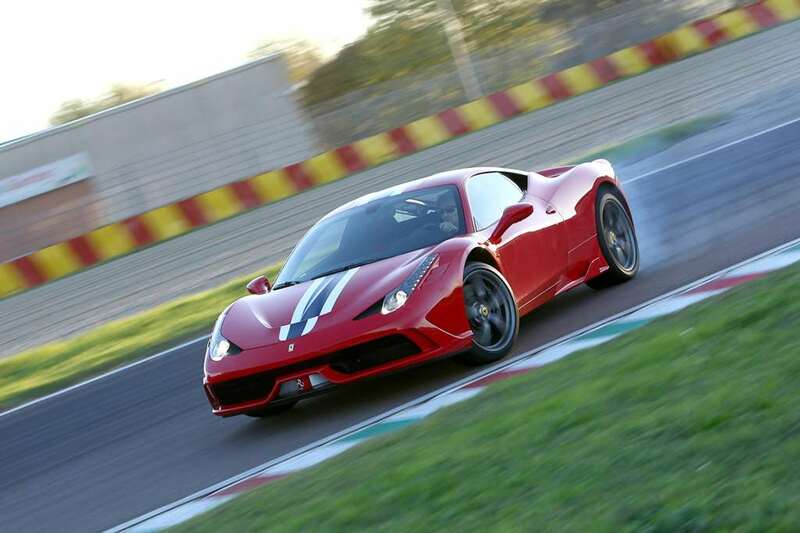 Ferrari 458: Can Ferrari move the game on again?